Bed bugs are not only disgusting, they're an expensive problem to have. So, how can you get rid of these pests without burning through your budget? First, make sure what you're seeing are, in fact, bed bugs. Beyond living in your bed frames, mattresses or headboards, these parasitic insects often lurk in dark areas. Check interior door frames, in between the folds of your curtains, behind loose wallpaper, and under chipping paint. Have you seen one? Chances are there are many more. 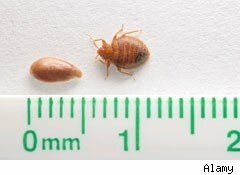 According to our experts, every one bed bug you see represents 12 that you don't, so once you identify an infestation you shouldn't waste any time before you exterminate. Those on a budget may go for a dry steamer or natural oil option, but they simply aren't effective in getting rid of these resilient bugs. And at $150, you're essentially pouring money down the drain. When it come to bed bugs, it pays to get professional help. Yes, pros can charge anywhere from $250 per room to exterminate, but this option is your best bet. It's pricey, but it's also effective. If you're unlucky enough to find bed bugs in your home, don't waste money on do-it-yourself removal options. In this case, paying for professional help will be ultimately better for your budget.